FILE - Russian President Vladimir Putin addresses the troops at the Hemeimeem air base in Syria, Dec. 11, 2017. A top U.S. general is accusing Russia of sowing the seeds of instability in Syria and across the greater Middle East, part of an ongoing attempt to expand its influence at the expense of the United States and the international community. "Diplomatically and militarily, Moscow plays both arsonist and firefighter, fueling tensions among all parties in Syria," the commander of U.S. Central Command, Gen. Joseph Votel, told lawmakers Tuesday. Votel further accused Russia of then offering to serve as a mediator in an effort to "undermine and weaken each party's bargaining position." The criticism, though worded more sharply than in the past, is in line with previous warnings from U.S. and Western intelligence officials, who have said Russia views Syria as an opportunity to reassert Moscow's central place on the world stage. FILE - Gen. Joseph Votel speaks during a news conference at the Pentagon, April 11, 2017. It also echoes concerns laid out in the most recent U.S. National Security Strategy, which called Russia a "revisionist power" intent on tearing down the current international order. "It is clear that Russia's interests in Syria are Russia's interests and not those of the wider international community," Votel said. "Their role is incredibly destabilizing at this point." But the general's words may also reflect a growing disconnect with the administration of U.S. President Donald Trump, which has often sought to emphasize areas of cooperation. While administration officials say there are areas in which Russian activity is impinging on U.S. interests, and in which the U.S. is pushing back, they say the Middle East is not one of them. "Is there a threat to us, a direct threat to us from Russia emanating from the Middle East? Obviously, the threat there is the terrorist threat and Iran," a senior administration official said recently on the condition of anonymity. In Syria, the U.S. and Russia have found themselves on different sides of the ongoing Syrian conflict, with Moscow backing the government of Syrian President Bashar al-Assad and the U.S. backing the Syrian Democratic Forces, a group of moderate rebels, who have until recently largely been focused on efforts to defeat the Islamic State terror group. FILE - In a frame grab made available by Russian Presidential TV Syrian President Bashar al-Assad, right, greets Russian President Vladimir Putin upon his arrival to the Hemeimeem air base in Syria, Dec. 11, 2017. Both Washington and Moscow have made concerted efforts to avoid conflict, setting up a deconfliction line in order to make sure their forces on the ground in Syria did not engage each other by mistake. Still, Central Command's Votel said Russia's actions in Syria are actively undermining efforts to roll back IS and, ultimately, find a political solution to the larger conflict. 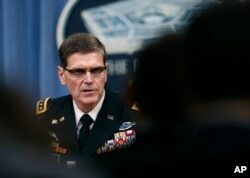 "Russia has placed this progress at risk with their activities which are not focused on defeating ISIS but rather on preserving its own influence and control over the outcome," Votel said, using an acronym for Islamic State. Votel also criticized Russia for its failure to follow through on its self-declared "humanitarian pause" in Syria's eastern region of Ghouta on Tuesday. Residents said at least six civilians were killed after just a brief pause in fighting, when Syrian government warplanes resumed their bombing of the region. 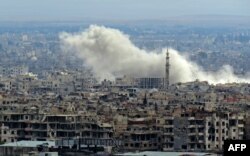 A general view taken from a government-held area in Damascus shows smoke rising from the rebel-held enclave of eastern Ghouta on the outskirts of the Syrian capital following fresh airstrikes and rocket fire, Feb. 27, 2018. Russian officials blamed the resumption of fighting on rebel groups, but the U.S. State Department put the blame on Moscow. "They're not adhering to the cease-fire because they continue to sponsor and back Bashar al-Assad's government. That is tragic," the State Department's Heather Nauert told reporters. In his testimony Tuesday before the House Armed Services Committee, U.S. Central Command's Votel was equally blunt. "Either Russia has to admit it is not capable or that it doesn't want to play a role in ending the Syrian conflict," Votel said. There are also concerns Russia is increasingly willing to use proxies and allies in Syria and across the Middle East to confront the U.S. as part of a larger, great power competition with the U.S. Earlier this month, pro-Assad forces attacked U.S. and U.S.-backed forces in Syria. U.S. defense officials have refused to comment on who directed the attack. But audio recordings obtained from a source close to Kremlin by Polygraph.info, a fact-checking project by Voice of America, indicate some of the forces were part of CHVK Wagner, a Kremlin-linked private military company. Analysts also see Russia's hand in Turkey's decision to launch an incursion into the Afrin region of northern Syria last month. FILE - Turkish army tanks enter Afrin, an enclave in northern Syria controlled by U.S.-allied Kurdish fighters, in Hassa, Hatay, Turkey, Jan. 22, 2018. 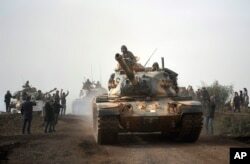 Turkish President Recep Tayyip Erdogan said at the time that Ankara had a deal with Moscow, and Russian media reported Russian troops in the area had withdrawn prior to the incursion. "Russia's played a very clever game here by being the newfound friend of Erdogan," said Luke Coffey, a former British defense adviser now with the Washington-based Heritage Foundation. "Then, of course, you throw Iran into this and [Syria's] Assad and you see this sort of deadly cocktail that is present that makes it more difficult for the U.S. to act and act in a coherent and strategic manner." Top U.S. defense officials, like Votel, worry that with Moscow's help, the stage is being set for more and bigger problems. "Russia is a party to this and they have responsibilities to ensure that the tractable partners that may be in this area are under control," he said Tuesday. Still, there are those who worry that as long as Trump administration officials are more focused on terrorist groups like IS and al-Qaida, and on Iran, Russia has the upper hand. "We never saw what's happening in Syria as a [great power] competition, but [Russian President Vladimir] Putin always did," said Anna Borshchevskaya, a fellow specializing in Russian Middle East policy at The Washington Institute. "We basically ceded Syria to him without even realizing it," she said. "With dictators, you always have to show strength. Putin will push until someone pushes back."